Zlatan Ibrahimovic marks his return from injury with two goals in a win for LA Galaxy, while Wayne Rooney also scores in a victory for his DC United side in the MLS. MLS side Real Salt Lake name their team by favourite pizza topping. 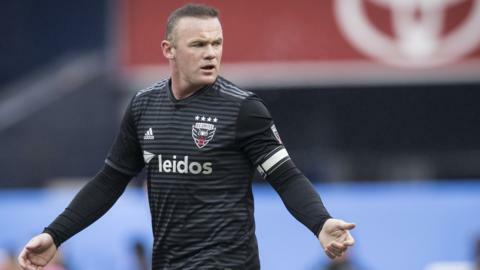 England's record goalscorer Wayne Rooney scores his first Major League Soccer hat-trick as DC United thrashed Real Salt Lake 5-0.
Who could be on the move in January? Read more on Who could be on the move in January? BBC Sport heads to Ohio to sample a unique fan experience with FC Cincinnati, the latest team to join Major League Soccer in 2019. Read more on FC Cincinnati: Are these the best fans in MLS? How does it feel for Beckham to have an MLS team in Miami? Read more on How does it feel for Beckham to have an MLS team in Miami? Will the US ever care about football? Read more on Will the US ever care about football? Roger Verdi recollects trying to make it as a British Asian in English football in the 1970s and playing with some of the game's greats in the USA.